There were 105 entries announced yesterday for the 2018 Randox Health Grand National to be run at Aintree on Saturday, April 14 with the weights for the great race to be announced next month on Tuesday February 13th. The former RSA Chase and Becher Chase winner Blacklion remains BetVictor’s 10/1 favourite and note this will be the last time current BHA handicapper Phil Smith frames the weights as he is due to stand down from his post in the summer. Our Duke is 5/2 favourite with BetVictor for Sunday’s Irish Gold Cup following the news that Road To Respect, who won the Grade 1 Leopardstown Christmas Chase last time, will swerve the race and head straight to Cheltenham. 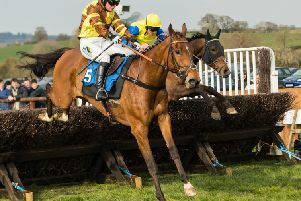 The going is described as heavy for today’s card at Wincanton and I will be interested to see how the Colin Tizzard runners fare given they remain largely out of sorts. Only three go to post in the Novices’ Handicap Chase and Persian Delight (1.50) gets the vote despite the fact that the Paul Nicholls-trained runner makes his chase debut against two previous winners. The selection is a winner of two of his seven career starts, is bred to make a chaser and, despite the fact that he has won over 2m 5f over timber, travels as if this drop back in trip will not be an inconvenience. There is a £25,000 two-and-a-half-mile handicap chase and Kayf Adventure is 6lbs higher than when scoring over C&D last month when he won despite continually jumping out to his left. Robert Walford’s Le Boizelo (3.35) won on the same card as Kayf Adventure in a faster time and he gets a narrow vote from Siruh Du Lac who showed tremendous battling qualities at Exeter last time. At Towcester, The Vocalist (1.40) was impressive at Huntingdon last time and she can defy a 6lbs penalty for Nicky Henderson and Nico de Boinville in the opening Mares’ Novices’ Hurdle. The Huntingdon win was gained over two-and-a-half miles and the drop to the minimum trip is a slight concern, but this stiff track will suit and she travelled very well through her race last time. Apache Song ran better than his finishing position would suggest at Kempton last time but he might be a non-stayer on this stiff track and Doc Carver (2.20) is a confident selection in the two-mile handicap hurdle. Henry Oliver’s seven-year-old was beaten half-a-length at Bangor last time and makes his handicap debut from what looks a fair mark. An Irish point winner he will get further in time but this stiff track should be ideal and he can take this before switching his attentions to fences next term. The Meydan Carnival continues in Dubai and I hope Benbatl (3.05) can follow up his recent C&D success despite having to overcome the worst of the draw in stall seven. I think the selection can make up into a Group 1 horse on fast ground this summer although I do think nine furlongs is on the sharp side for the horse despite that fluent win here three weeks ago. In the closing 12-furlong handicap, Gold Star (6.00) can build on his excellent comeback when second over C&D off a 2lbs lower mark three weeks ago. Stall ten isn’t the greatest of draws for Christophe Soumillon to overcome, but this lightly raced sort looks a Group horse to me although he will want a true test at this trip. At Kempton this evening, Western Way (8.30) is well drawn and is only 3lbs higher than when scoring well at Chelmsford last time. Adam Kirby keeps the ride for the shrewd yard of Don Cantillon who is unexposed over two miles on the all-weather despite being nine years of age. The horse has run well in his last three starts, which have been over a variety of trips (7f, 12f, 16f) and he can go in again.